My obsession with quick meals continues. I was convinced that the Italian Chicken Bake I shared was the easiest recipe ever, but this is actually a little easier (no chopping of the garlic) and just as tasty! 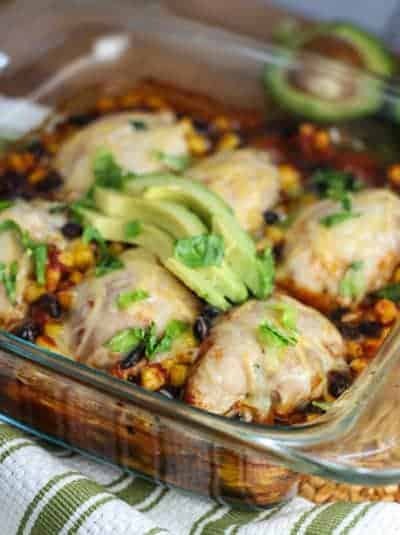 All you do is toss together corn, black beans, salsa and a few spices…top with chicken and bake! I used canned corn because that’s what I had but I think fresh would be fantastic. You could also add a fresh chopped jalapeno if you like some extra heat. One pan, like one as in number 1, you mix and bake in the same baking dish. You can kick it up with fresh ingredients if you have them. Oh, and it’s healthy (just watch the cheese).Enjoy! 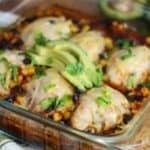 An easy to make southwest chicken. Spray a 8 x 8 baking dish with non stick spray. Add all ingredients excluding chicken, to the baking dish and stir. Bake for 40-50 minutes or until chicken is cooked thoroughly. No…does not need to be covered! thanks! Hello Kathi! This looks delicious, I’m thinking of making it soon. I was just wondering if you had any specific recommendations for salsas? I mostly use Trader Joe’s salsas- they have a basic green and a basic red, would either of those work/do you think would one be better than the other? Hi Sophia! – I usually use Pace Picante, it’s always been my favorite but I have had TJ’s salas and they are great. Don’t think you can go wrong…this is such a simple recipe. I hope you love it! This meal was extremely easy AND delicious! Definitely impressed my roomies with this one! Hi Aliya! Thank you for taking the time to send such a nice note! I’ve got a new Southwest Chicken Rice Skillet Dinner coming out soon that I hope you will try! Your roomies will love this one too! Your southwest chicken recipe was awesome, my family loved it! The only thing I did different was that I used a whole chicken cut up into pieces and served it with Spanish rice. I will definitely be making this again! Hi Denise! I’m so glad you liked it…thank you so much for the note! Could I use chicken breasts for this instead? You bet! Take a look a this Mexican Casserole I posted a couple weeks ago. Its similar and uses chicken breasts. My family loved it. I used Cocina Fresca Mild Sweet Onion Salsa. Thanks for the recipe. Hello Anne! I’m so glad you and your family liked it! I made a similar chicken dish called Italian Chicken Bake that you might want to check out as well! Thanks for the note! Kathi, this looks delicious! I’m a huge fan of quick/easy meals and could definitely be taking more advantage of them. Thanks for sharing this amazing recipe!